Sonoma County – List of Stone Quarries, Etc. 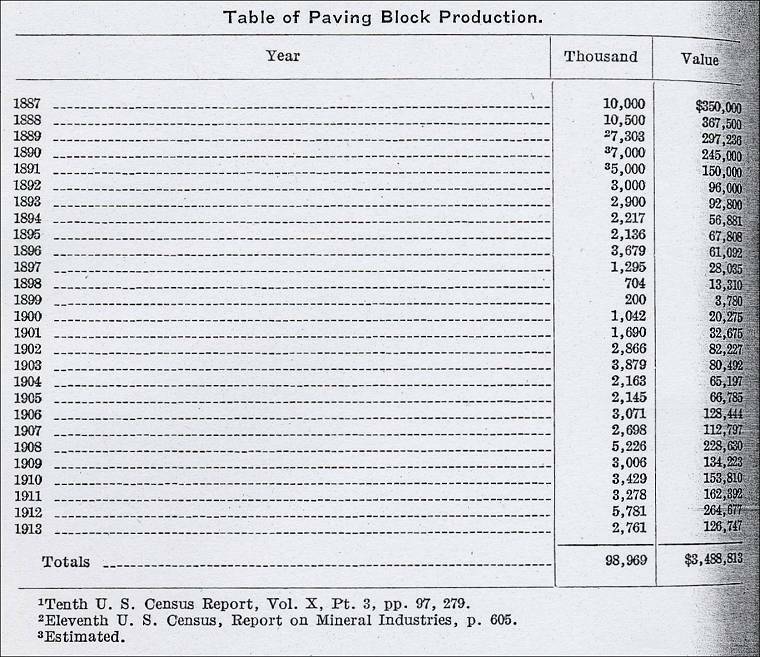 Sonoma County Paving Block Industry (circa 1904) – Excerpts from The Structural and Industrial Materials of California, Bulletin No. 38, California, State Mining Bureau, San Francisco, California, 1906. Sonoma County Volcanic Rock (“trap rock”) Resources circa 1913 – Included in chapter in “California” (pdf), by G. F. Loughlin, in the Mineral Resources of the United States Calendar Year 1913, Part II. Nonmetals, United States Geological Survey, 1914. Sonoma County Mines and Mineral Resources (circa 1913-1914) – Excerpts from Report XIV of the State Mineralogist – Mines and Mineral Resources of Portions of California, Chapters of State Mineralogist’s Report – Biennial Period 1913-1914, Part II. 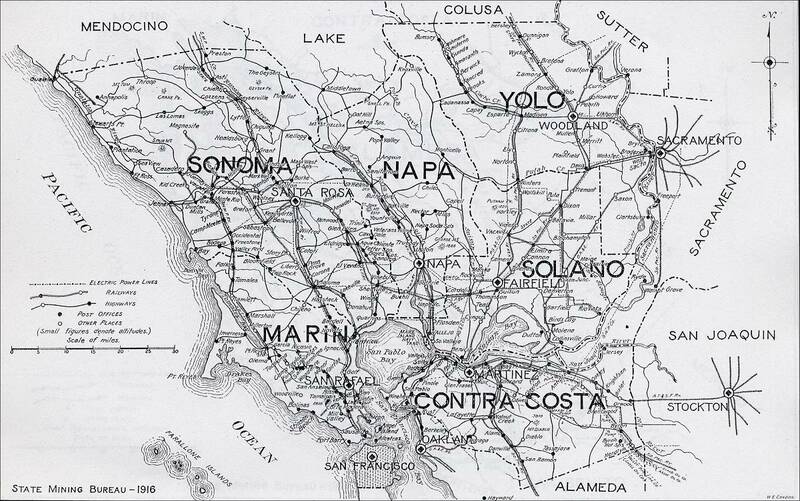 “The Counties of Colusa, Glenn, Lake, Marin, Napa, Solano, Sonoma, Yolo,” by Walter W. Bradley, Field Assistant (field work in October and November, 1913), San Francisco, California, July, 1915, 1916. Sonoma County Mineral Industry (circa 1919) – Excerpt from California Mineral Production for 1919, Bulletin No. 88, by Walter W. Bradley, California State Mining Bureau, 1920. Sonoma County Limestone Industry and Deposits (through 1947) – Excerpts from “Limestone in California,” by Clarence A. Logan, California Journal of Mines and Geology, Vol. 43, No. 3, July 1947, California Division of Mines, San Francisco, California. Sonoma County Mines and Mineral Resources (circa 1913-1914) – Excerpts from Report XIV of the State Mineralogist – Mines and Mineral Resources of Portions of California, Chapters of State Mineralogist’s Report – Biennial Period 1913-1914, Part II. “The Counties of Colusa, Glenn, Lake, Marin, Napa, Solano, Sonoma, Yolo,” by Walter W. Bradley, Field Assistant (field work in October and November, 1913), San Francisco, California, July, 1915, California State Mining Bureau, San Francisco, California, 1916, pp. 173-370. “Sonoma County is both a coast county and one of the ‘North of the Bay’ group; being bounded on the west by the Pacific Ocean and Marin County, on the north by Mendocino, on the east by Lake and Napa, and on the south by San Pablo Bay. It has a land area of 1577 square miles. The drainage of the northern two thirds of the county is to the Pacific Ocean, principally by the Russian River and its branches; while the southern end drains to San Pablo Bay through Petaluma and Sonoma creeks. Though part of two separate drainage areas, the main valley through the center of the county is some 60 miles north and south by about 25 miles wide. “The mineral resources of Sonoma County are quite varied, as will be noted by the Table of Mineral Production. * In the order of their value to date they are (circa 1913): Stone industry, quicksilver, brick and clay products, mineral water, mineral paint, magnesite, graphite, lime, gems, and infusorial earth. Their total recorded production to date, has been approximately $7,600,000. The actual output must certainly have been considerably in excess of this, as there are no figures for stone industry earlier than 1887, though paving blocks have been made in Sonoma County since 1864 (Tenth Census Report, Vol. X, Pt. 3, p. 97); nor are there any figures for bricks earlier than 1887, nor for mineral water earlier than 1895. Though in this latter case some of the springs are known to have reported sales for at least ten years previously, the figures are not available. 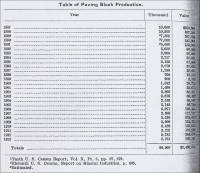 Sonoma County – Table of Mineral Production. “Through an error, production of granite from Sonoma County was reported both to this Bureau and to the United States Geological Survey, for several years. I found, on visiting the quarries, that the material so reported from Agua Caliente is a vitrophyre associated with trachytic tuff. That classified under ‘curbing’ from other parts of the county is the andesite from which most of the paving blocks are made. “The stone quarries’ products have been one of Sonoma County’s most important assets for many years. The majority of the paving blocks employed in street work in the cities of the state have come from the quarries of this county. For a considerable period this particular branch was much more prominent than it is at the present time, and gave employment to several thousand men. Following the San Francisco Fire of 1906, the demand for paving blocks was good for a time and the year 1912 was a prosperous one; but the Block Makers’ Union demanded raises in the contract price successively from $25 to $30, then to $35 per 1000. This, coupled with the increasing number of motor driven vehicles and their demand for a smoother pavement, caused operations at many of the quarries shut down altogether, while others were curtailed to the output of only a few men. It is stated that one man will make an average of 100 to 150 blocks per day. At the time they were visited (October, 1913) there were approximately 1,600,000 blocks piled up at the various quarries and at the railroad shipping points, awaiting a market. “In addition to the $35 per 1000 for making, those operators who are leasing pay $3 to $3.50 per 1000 royalty to the owners. It costs from $2 to $5 per 1000, depending on the distance, to haul them to the railroad. In case they can not be loaded directly onto the cars but have to be temporarily piled beside the track, it costs an additional $1.50 per 1000 to put them on the cars. The blocks sell at $45 to $50 per 1000, f.o.b. the rail shipping point. “Though they are loosely designated by the trade as ‘basalt blocks,’ the rock for the most part is andesite. Particularly is this the case along the ridge which starts above Rincon Valley, northeast of Santa Rosa, trends southeasterly to near Kenwood. Locally, in places, it grades to basalt, and at others to trachyte. This stone is also employed for making curbing, and as such was erroneously reported for a number of years under the head of ‘granite’ (as has already been noted. See under Granite). Location: South of Mendocino County, bordering on the Pacific Ocean. “Sonoma ranked thirty-fourth among the counties of California during the year 1919, with a mineral production of $286,038, as compared with its 1918 output worth $586,391, the decrease being due mainly to chromite, magnesite, and quicksilver. More paving blocks have been turned out here than in any other section of the state. “Among Sonoma’s mineral resources are: Brick, chromite, clay, copper, graphite, infusorial earth, magnesite, manganese, marble, mineral paint, mineral water, quicksilver, and miscellaneous stone. Sonoma County, 1916 Map, from California Mineral Production for 1919 (with County Maps), Bulletin No. 88, by Walter W. Bradley, California State Mining Bureau, San Francisco: California State Printing Office, 1920, pp. 187.